With a mammoth 15,000 lb. 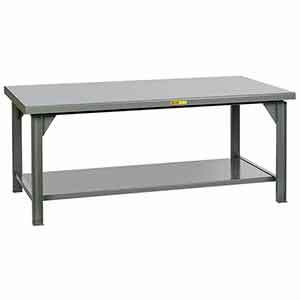 capacity, this all-welded steel work table can handle the most punishing applications. Thick C channel legs support a reinforced 7 gauge steel top, and a 12 gauge lower shelf provides storage space under the table. Feet include 5/8" lag holes for anchoring to the floor. Finished with a durable powder coat paint. D x W: 36" x 60"
Lower Shelf Capacity: 500 lbs.